My first Gen Con is now a matter of record. I survived the experience, which can only be summed up in one world – overwhelming. 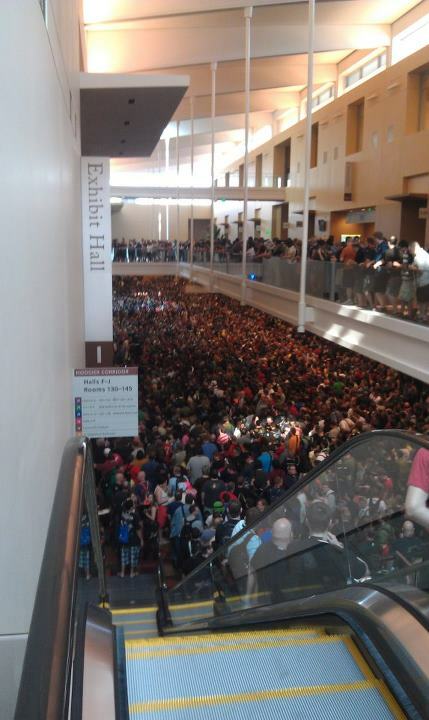 The sea of humanity before Gen Con opened the doors on Thursday morning. In the course of approximately 72 hours, I got to spend time with a great friend from another area of the country I rarely get to see, walk about 15 miles to, from and around the convention center, play an assortment of games for the first time, listen to employees of Wizards of the Coast talk about the future of Dungeons & Dragons and offer tips for running better games, salivate over rows and rows of awesome merchandise that would leave me broke and last – but certainly not least – meet many of the interesting people I have communicated with online since the construction of this blog in 2011. The experience was fantastic, and there is no way I could condense my experience into one coherent post. My struggles with successfully buying a set of dice as a souvenir from the show. My first exposure to other games not called Dungeons & Dragons, including Ascension, Dominion and Settlers of Catan. The organized play sessions for D&D Next and 4th Edition, which were both truly engaging and fun and taught me a bit about how to be a better player and DM. A conversation with Mike Shea regarding the trajectory of The Id DM. Expect each bullet above to turn into a hyperlink as I add the article on that specific subject. I have attended conventions previously, both for professional meetings – such as the annual conference for the American Psychological Association – and for geek activities like Star Wars Celebration. The conventions always offer more than could possibly be consumed by one individual. Gen Con was no different in this regard; I had to leave the official program at the hotel because it was so massive and weighed down my backpack too much. Even with the knowledge of how difficult it can be to structure a convention experience, I still found myself dizzy from the possibilities. Stabby is lurking . . . always lurking. Day 1, Thursday. I woke up early and set about the 1.5 mile walk from our hotel to the convention center. While it would have been nice to be at one of the many hotels close to the convention center, starting the day with a nice walk was a good way to ensure I was wide awake and alert by the time the convention started in the morning. 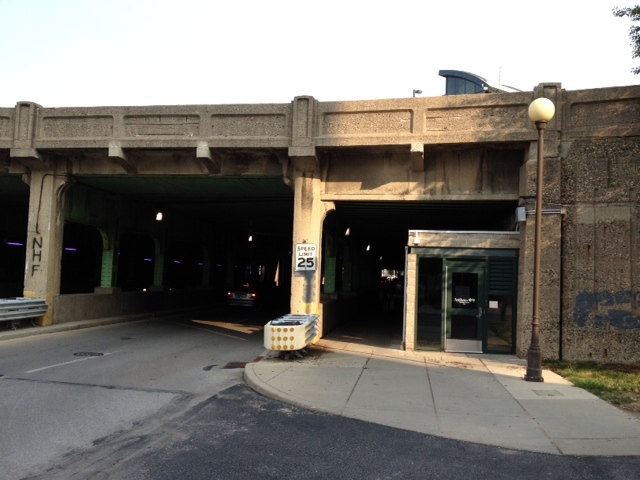 It also gave me a chance to delve into Stabby the Hobo’s Lair for the first time; Stabby and I would have many an interaction during the walks through Indianapolis. Perhaps the most enjoyable aspect of the first walk to the convention center was the cross walk buttons at stop lights. Whenever you pushed the button to cross the street, a robotic male voice would say, “Wait.” My friend commented that it would be funny if the voice was replaced by the singer of White Lion; we then spent the preceding days debating the best part of White Lion’s “Wait” that could be featured on the cross walk button and settled on the few seconds starting at the 3:00 mark below. Thursday was the day I loaded with scheduled gameplay sessions and panels. They started immediately with the D&D Next Playtest at 10AM. I was fortunate enough to meet Mike Shea and his lovely wife just outside the room and we all sat down together to go through a quick 30-minute character creation process. Staff from Wizards of the Coast assisted with the new character creation rules, which included rolling four d6s and taking the best three results for each stat. My first roll for strength was: 6, 6, 5, 1. Fighter it is! After completing characters we were shuffled over to another table to meet our DM and start the adventure, which lasted a bit over an hour. When the D&D Next session was completed, I ambled outside to the line of food trucks and devoured some lunch. Then it was back inside to listen to the Creating the Core panel for D&D Next. I later made my first pass through the Exhibitor Hall and got back in time for the D&D 4th Edition play session at 4PM. The 4th Edition playtest featured a party of Drow with competing agendas; the two-hour session was a great time and I’ll provide more details about both the Next and 4th Edition playtests in a future column. By 6PM, it was raining outside (I think the only rain in Indy during the entire convention) and we took a cab back to our hotel. We did not venture back toward the convention center but stayed in our hotel and played a few games of Dominion before crashing. We were trying to conserve some energy for the rest of the week! My prize from Gen Con. Day 2, Friday. We walked once again to the convention center and had less of an agenda. The only thing I had scheduled for the day was the D&D Next panel on DM Monsters, Magic Items and DM Mischief. It was great to hear the thoughts of the design team regarding the need to make the DM’s life as easy as possible in the next edition of D&D. 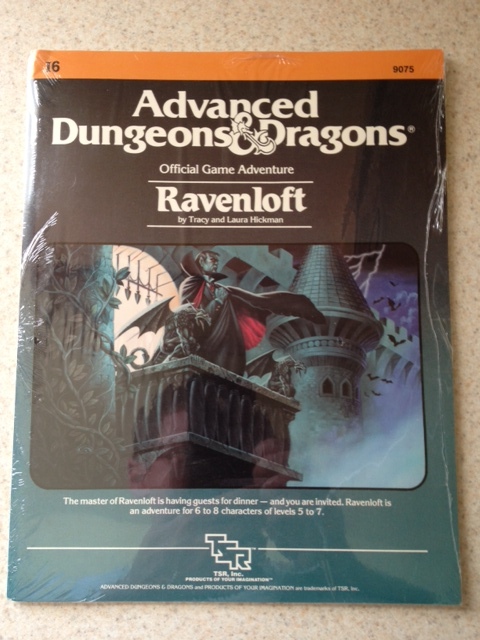 I was also fortunate enough to win an original sealed Ravenloft module by answering a trivia question from Chris Perkins. I blatantly cheated by using my phone to search for the answer, but no one knew the answer right away and the panel joked, “To your phones!” I was able to find a Ravenloft Wiki that provided the answer to Chris’ question, “What are the names of Strahd’s brothers?” The answer is – Sergei and Sturm. I was also able to ask the panel about the disparity in preparation time required for DMs and players to play a session of D&D, and another person in the audience followed up on my question, which I thought was cool. After the panel, I was able to elbow my way up to the front to introduce myself to Chris Perkins and offer my gratitude; I only got back into D&D after listening to the Penny Arcade podcasts several years ago. While I thought about sharing a few of my thoughts about articles I’ve written related to those podcasts and his recent admission of only rolling one die for damage, I did not want to be that guy who over stays his welcome. Plus, right before I walked up to Chris Perkins, Mark Talbot from 20ft Radius introduced himself to me and I wanted to talk more with him. However, by the time I turned around after speaking with Chris Perkins, Mark had vanished. This is what happens at Gen Con. You cannot possibly interact with everyone you want to at once! The rest of the day was composed of two activities – tracking down a variety of individuals I’ve communicated with through Twitter over the past 18 months and consuming the Exhibitor Hall. This is easier than it sounds; at any given moment there are over 30,000 people walking around the convention writing texts and tweets back and forth searching each other out. I decided my souvenirs from Gen Con would be art and dice, which will be covered in a future post. I traveled the artist booths and inquired if any of the artists would take on a commission to draw my mascot, Iddy the Lich. I found two artists who were willing to take on the commission and they have wonderfully different styles. 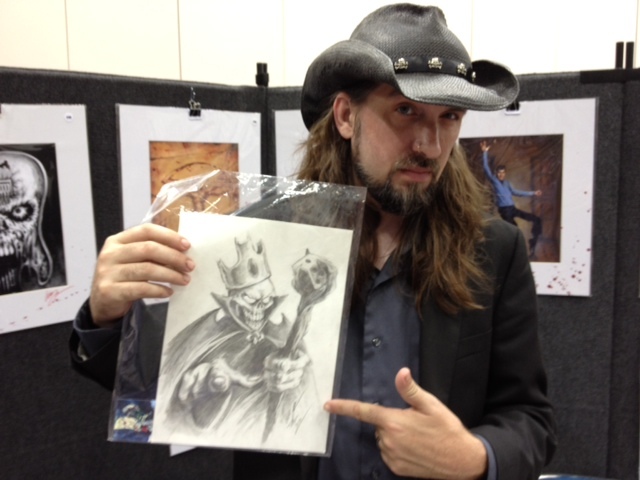 The first to complete a commission of Iddy was Billy Tackett who is a “Zombification Specialist and Father of the Zombie Mash-up.” Considering Iddy is an undead Lich, this seemed like the perfect gentleman to provide a fearsome depiction of the character. He did not disappoint! The second artist to draw Iddy was Connie Faye who states on her website that her personal subject matter tends to be dark ethereal almost primal female creatures. I was eager to see how see would depict Iddy in her style and she produced a pleasantly aggressive pose for him. When I picked up the commission, she told me she wanted to make his stance a bit more active than his usual standing-up-straight stance. If I ever create a Stat Block for Iddy, he’s going to have different Stances now! Iddy stands out just a bit from all of the beautiful female creatures Connie has created. Brian’s panel also featured a funny moment when I realized that I was sitting next to Tracy Barnett, who I also interviewed last year. Since the panel already started, I did not want to interrupt by tapping him on the shoulder to introduce myself, so I responded to him with the following tweet. Several minutes later, I saw him check his phone out of the corner of my eye. He read the tweet, looked over at me and then turned bright red as he had to stifle a laugh when I waved to him. We introduced ourselves after the panel concluded, and he was a really nice guy. Many of us went out to dinner after the panel to a local place, Scotty’s Brewhouse, that caters to the Gen Con audience by giving out a custom d6 to those that order items off of a special menu. Day 3, Saturday. By this point, Indianapolis was overrun with nerds and bikers. A palpable buzz filled the streets as we walked to the convention for the last time since we had to leave early on Sunday. Our goal for Saturday was to play and demo as many new games as possible – and play and demo, we did! Throughout the day, we played Kingdom Builder, Ascension (much more on the this in another column) and other titles. I was able to wander around the Exhibitor Hall for a few hours and get lost in all the great products. I was also able to meet Monte Cook while he was signing at DriveThruRPG and thank him for his insightful responses during my interview with him earlier in the year. The only things I had on my schedule were panels early in the evening so it was a good day to slow down, play games and track down people I had not been able to meet yet. My friend had tickets to a Magic: The Gathering event in the afternoon, so while he joined that I attended two podcasts. The first was a Gamer to Gamer episode that featured an interview between Tracy Barnett and Chris Perkins. Mr. Perkins was incredibly gracious and personable as he answered questions from Tracy and later the audience. The biggest tip I walked away from after his interview concluded is to not be afraid to fail as a DM. Mistakes are going to be made, but throw yourself out there and focus the adventure on the characters to draw in the players as much as possible. The second podcast was an episode of The Tome Show; I have listened to many episodes of this podcast while driving to and from work or walking my dog – so it was great to see Jeff, Mike and Randall interact with each other live. I also walked away with a free Jeff Greiner t-shirt! 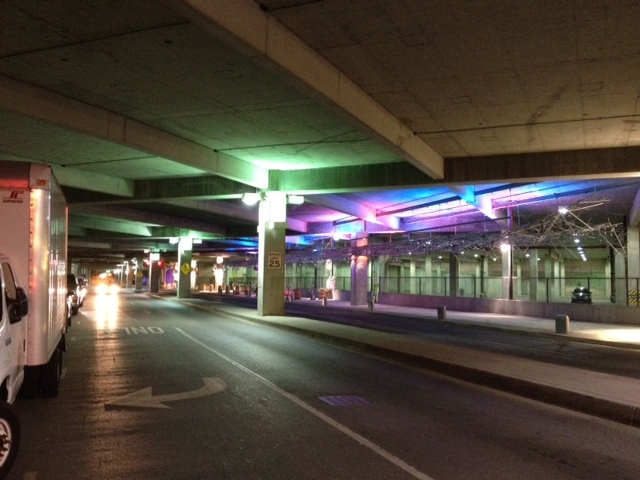 Don’t let the pretty lights fool you. Stabby could execute a sneak attack at any moment. I met a few people for dinner and had a very interesting conversation with Mike Shea about the future of my site (more on this in a later column). We all spoke about the games we play and what we thought about the direction of D&D Next. It was a great way to finish off the weekend. My friend found us after his Magic tournament ended and we ventured through tens of thousands of motorcycles (literally) and Stabby the Hobo’s Lair one last time. We survived Stabby and his minions – and survived our first Gen Con. This entry was posted in Gen Con and tagged D&D, DM, Dungeon Master, Dungeons & Dragons, Gaming, GenCon, RPG, Wizards of the Coast. Bookmark the permalink. Everyone’s GenCon recollections are getting me pumped for next year. My wife already said she’d come with! It was a great time. I hope you can make it next year! I would have loved to have chatted with you longer also, but I had a game I absolutely had to attend, which was good, because we won the title of 2012 Fourthcore Team Deathmatch champs GenCon 2012. We will have to get together next year and play some games and share a draught of Ale of Destiny. It was nice putting a face to a name. For next year, I will have a data plan and if you add me on twitter, we could find each other. Ciao for now. Thanks for writing! I had a thought maybe you were a bit annoyed I turned my back. Glad that wasn’t the case. 🙂 Congrats on winning the Fourthcore event! Thanks. No, I fully understand why you did. These guys at wotcee are hard to pin down. hehe. I am sorry that I came across as annoyed. I was overwhelmed with everything at the Con and rushed to boot. Not a good combo for meeting people. Still glad I got to make your acquaintance, however briefly. Next year let’s make it longer. You’re absolutely right about too much to do … I’m sorry we didn’t get a chance to meet, but here’s to next year! Looking forward to more of your thoughts on GenCon. I enjoyed following your tweets during the con. The pictures were a nice addition and I enjoyed following your adventure as the weekend went along. Thanks! You are welcome. I was certainly that guy who was walking around with his head buried in his phone but there were too many interesting things to comment on while I was there. Great write-up, Mike! 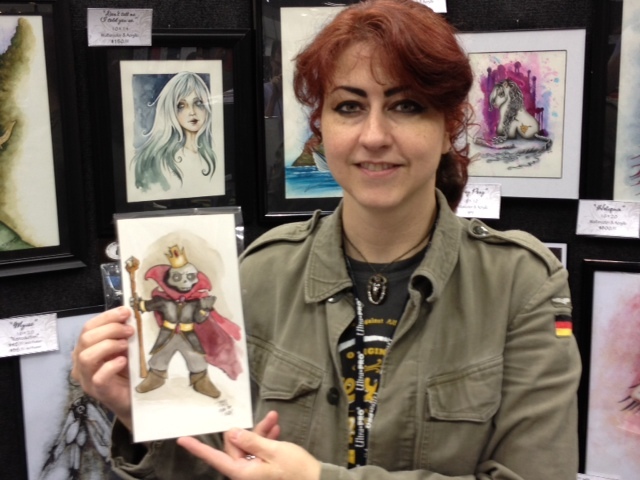 🙂 I hope I can make it to the show next year, especially with all the Blade Raiders pimpage I’ll be wanting to do… BTW, awesome that you had my pal Connie do an Iddy drawing! Did you know that she and I knew each other? Late to the party but I echo @JeffM’s comments about the pictures you tweeted. It was more than kind of you to share the experience live. You were an excellent resource for many of the Con-happenings about which I was most interested. Fun fact: I know White Lion’s drummer, Greg D’Angelo on a professional basis. Now _I’ve_ got them stuck in my head! Thank you for the kind words. And for having White Lion stuck in your head – you’re welcome.